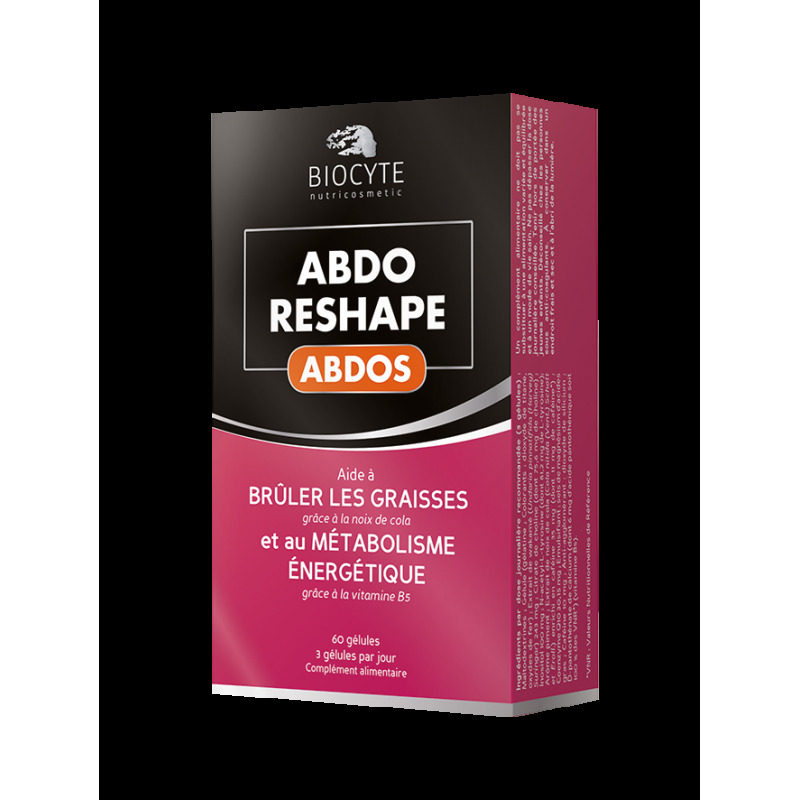 Biocyte abdo reshape® is a fat burner that helps maintain normal energy metabolism, thanks to kola nut and vitamin B5. Our increasingly high calorie diet paired with low energy expenditure can lead to weight gain. When used in the context of a varied and balanced diet, Biocyte abdo reshape®activates lipolysis. As part of a weight loss program, it burns fat, thanks to kola nut and helps maintain normal energy metabolism, thanks to vitamin B5.Abdo reshape® also contains coenzyme Q10, choline, caffeine and wakame, which helps suppress appetite and control weight. Take 3 capsules per day in the morning during breakfast or 1 hr 30 min before exercising, with a large glass of water. Use for 3 months. Repeat if necessary. - For individuals looking for fat burning results during a slimming program while maintaining a normal energy metabolism. Dietary supplement with wakame and kola nut extracts, choline, inositol, L-tyrosine, coenzyme Q10, caffeine, and vitamin B5. Keep out of the reach of children. Do not exceed the recommended dose. Store in a cool, dry and ventilated area. Use as part of a diverse and well-balanced diet. It is important to maintain a healthy lifestyle. Contains caffeine: 21 mg per day, should not be used by children and pregnant women. Biocyte CLA Max® provides an optimum daily dose of CLA and vitamin E, which contributes to the protection of cellsfrom oxidative stress.